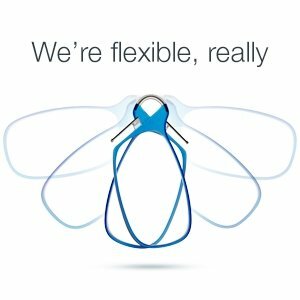 Flex-fit technology synergizes titanium alloy's flexibility with independent-suspension nose pads, delivering a universally comfortable yet stable grip on any nose, up high or down low. ThinOPTICS invented Flex-Grip Technology allowing the resilient bridge to flex while the smart independent-suspension nose pads flex and grip to ensure a secure and comfortable fit on all noses. 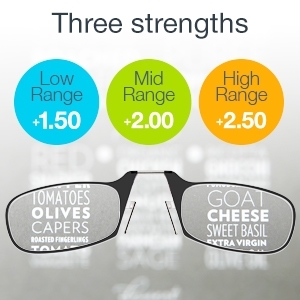 Wear them up high on your nose bridge or down low, either way ThinOPTICS are your noses' constant companion. Feeling light-hearted today? Sophisticated and intellectual? Or maybe you need the perfect match for your azure blue top? The ThinOPTICS #rainbow of stylish colors can match your style, mood or virtually disappear on your face. It's your call! Ultra-flexible titanium alloy bridge made from Nitinol (10x more elastic than spring steel). Independent-suspension nose pads ensure a universally comfortable and stable fit. 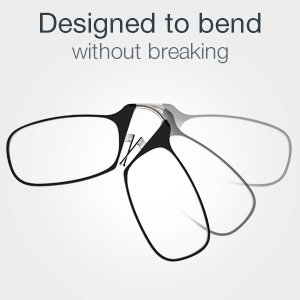 Stylish shatter-proof polycarbonate frames. 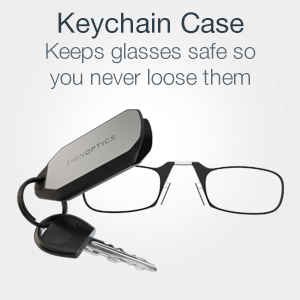 The Keychain case keeps your glasses safe and constantly available. Simply push the slider forward and ThinOPTICS glasses effortlessly unfold out of the case. Click the nose bridge into the case and pull back on the slider to safe store them.